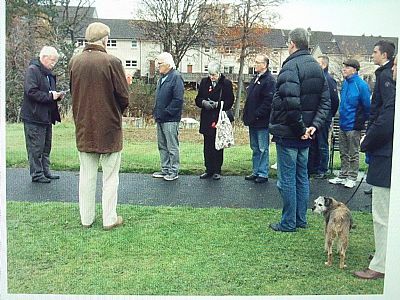 At 11am on Remembrance Sunday about 15 people attended LCC's ceremony at the war memorial in Redhall Park (see picture below). Good morning, can I welcome you all to our 2018 Remembrance Day ceremony. This event has been organised by Longstone Community Council. My name is Des Loughney and I am chair of the Community Council. 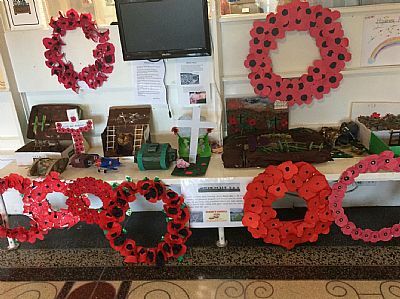 Today is a special Remembrance Day since it is a 100 years since the signing of the Armistice. This memorial was opened in 1922 to commemorate the local armed services people who died in the two world wars: 48 in World War 1 and 24 in World War 2. The agenda for today is that I will read a war poem and the verse from the poem by Laurence Binyon ‘For the Fallen’ and make a few remarks. There will then be the two minutes silence. After that wreaths will be laid. People laying weaths are welcome to say a few words. The ceremony will end once the last wreath has been laid. This is the poem by the famour war poet, Wilfred Owen, called ‘Anthem for Doomed Youth’. It was written in 1917. Wilfred Owen was killed at the front just before the Armistice in November 1918. Owen spent some time during the war recovering from shell shock near here at Craiglockhart Hospital. During that time he taught at Tynecastle High School. I first read this poem at a school Rememberance ceremony in 1963. As a final thought can I say that I visited my son who is working in Japan. I spent a few days in Nagasaki and visited the site of the second atomic bomb explosion which killed 100,000 people. In addition to all the service people I think we should remember the millions of civilians, men, women and children, who died in both wars. 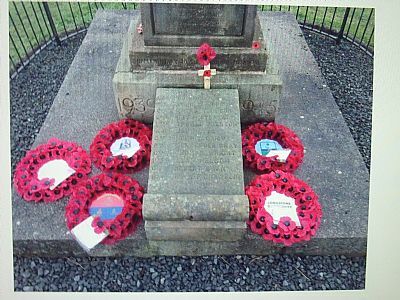 Wreaths were laid on behalf of LCC and Sainsbury's staff.